I wanted to let you know that I am going to make a one-man, peaceful protest outside the Scottish Parliament this Thursday the 22nd March 2018. The 22nd March 2018 will mark two years to the day since my petition for a Sunshine Act was closed. The petition closed on a most positive finding: that the Scottish public, in an official consultation (by the Scottish Health Council) concluded that declarations of competing interests should be mandatory and recorded centrally in an open register. The Scottish Parliament Petitions Committee approached my petition with great care, thoroughness and thoughtfulness and I want to put on record my appreciation of this. I have also had some wonderful support from Scottish parliamentarians, both current and retired, and I wish to thank them all. In the two years that have passed since my petition was closed there has not been a single update from the Scottish Government to the Scottish public on Sunshine legislation. This is most disappointing given that Nicola Sturgeon stated in her first week as First Minister: “I intend that we will be an open and accessible Government”. Over the years I have found it very difficult to communicate with the Scottish Government and have faced negative consequences for doing so, both personally and professionally. Professor Walter Humes has recently given this perspective on, what he terms, the “inner circle” of Official Scotland. As I have made you aware, your wonderful initiative for Realistic Medicine has nothing but my fullest support. It has always been my hope that Scotland could also lead the way with Sunshine legislation. Indeed, it is my view, and clearly that of the public, that sunshine legislation should be an integral part of Realistic Medicine. Can you please pass your thanks to Martyn McDonald, Team leader: Medicines Policy for responding to my previous letter to you. I am grateful for this update. However, and my apologies for reiterating: it was an update to the Scottish public that I had suggested and I do hope that your Directorate will consider providing this. Realistic Medicine and informed choices need to be based upon such conversations. 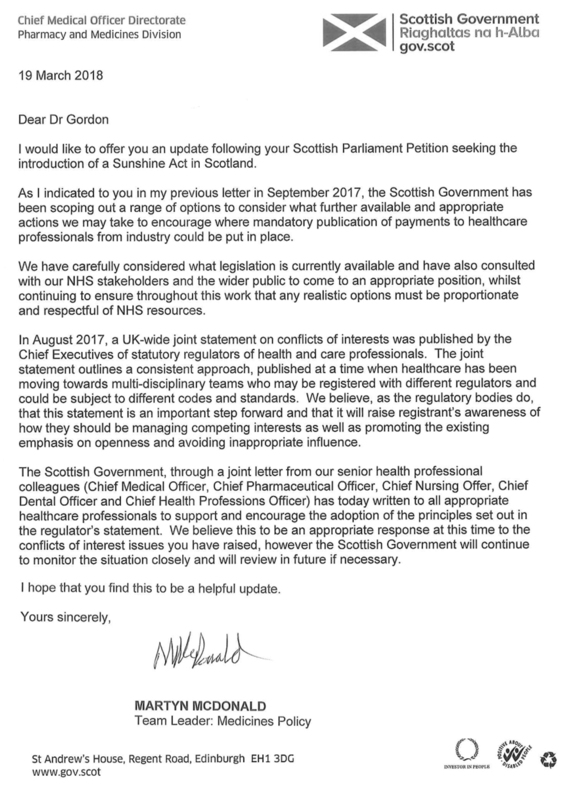 Mr McDonald’s letter sets out that the Scottish Government has, over the last two years, been “scoping out a range of options” where “mandatory publications of payments to healthcare professionals from industry could be put in place”. However the outcome of this two year long process, none of which has been open or transparent, has led to your joint letter of 19 March 2018 to all healthcare professionals in Scotland. This letter states your intent to “support and encourage the adoption and principles” of the joint statement dated 8 August 2017 by the Chief Executives of statutory regulators of health and care professionals. Whilst I support the joint statement of 8 August 2017 (and interestingly as a practising clinician this is the first time I have been made aware of it), it is nothing new and I am most disappointed that it falls far short of providing what the Scottish public agreed was necessary: a mandatory, single, searchable database of potential conflicts of interest. A number of health–related issues have recently been discussed in the Scottish parliament where one factor under consideration was the potential for competing financial interests to undermine “fully informed consent”. These issues have the potential to be costly both to individuals and to the NHS as a whole. A single, central, open database based on statute, would therefore be “realistic, proportionate and respectful of NHS resources”. The Scottish Government ought to explain to the people and the parliament of Scotland why it has taken two years to effectively change nothing.